‘David Bowie Is’ at the V & A: An interview with Geoffrey Marsh, co-curator. Given unprecedented access to the David Bowie archive, The Victoria & Albert Museum of Art and Design in London is staging a large retrospective of the singer’s career using over 300 objects including costumes, set designs, instruments, music videos, handwritten lyrics and photographs. The museum has commissioned an innovative sound system carried by all visitors to the exhibition, playing songs and commentary triggered by movement towards specific displays. This creates an ambient auditory experience throughout the exhibition. Joshua White spoke to the exhibition’s co-curator and Director of the Department of Theatre and Performance, Geoffrey Marsh. Joshua White: Why are you mounting a David Bowie exhibition now and how did it originate? Geoffrey Marsh: Part of our brief at the museum is performance covering rock and pop as an extension of musicals and variety. Famously, we staged an exhibition dedicated to Kylie Minogue, one of the most popular ever, and one for Annie Lennox. Originally, we were considering another performer but we become stuck on copyright issues. If you miss a slot in a museum you might have to wait another 3 or 4 years. The Pop world is very small and someone got in touch and asked if we would consider anyone else and we wrote down a list of people we would be interested in. After a long silence we received an email asking us if we wanted to see Bowie’s archive, which has its own curator. Bowie is very interested in technology and the archive has a database. The exhibition is a tiny proportion of about 75000 items much of it photographs. I never met David Bowie or spoke to him and he made it clear that he wouldn’t get involved but we could borrow anything we wanted. When we started two years ago it was clear that he wasn’t doing anything musically so the recent album is a coincidence and not deliberate timing. JW: Why didn’t Bowie participate in planning the exhibition? GM: That’s an interesting question and when we started it was a bit odd. But within a few weeks I realised that he’s a workaholic at a Picasso level of working. He’s a control freak and I think he would admit that. JW: That comes through from seeing the exhibition and how he pushes through his vision. GM: If he had been involved, it would have become his exhibition. JW: You would not have had a curatorial role and so it seems his absence gave you complete freedom to mount the exhibition you wanted to make. GM: Funnily enough dealing with his archivist was like dealing with another curator. It was a strange process and proceeded quickly in the two years from start to finish but there are some rough edges – too many exhibitions are so refined. JW: Your exhibition is very eclectic. There appears to be a deliberate strategy in the design and object selection to mirror the way he works through sampling and synthesising pre-existing cultural material. GM: The concept was described by a member of staff here as a ‘dog’s dinner’ before the exhibition was built. I’ve got an odd career history. I’m a ‘jack of all trades and a master of none’. I worked at the Imperial War Museum for ten years and trained as an archaeologist. Previously at the V & A, I worked on the Diaghilev exhibition at the museum and people ask how could curate both exhibitions. What interest me are exhibition concepts. Theatre and performance deals with intangible heritage. How you present that is very challenging. The majority of exhibitions are about fine art, but it’s very difficult to present popular culture because it deals with ephemera. Art history is concerned with linearity while pop culture is diverse. There’s the same challenge in a saleroom. How do you value a suit? Famously, Bowie, has been an early adopter of new technologies and he behaved like a search engine in 70s and 80s. He’d mention the novel ‘1984’ and people would go off and read it. JW: Bowie seems to embody a meeting of the Internet age with postmodernism. GM: Bowie is the ultimate postmodern artist but I didn’t want to get to hung-up on postmodern theory. However this is the first time headphones have become the dominant experience of the exhibition in the UK. The sound design is trying to mimic our lives. To my son that’s old hat. When he sits on the bed, he’s wearing headphones with the computer turned on doing his homework simultaneously. That’s the nature of pop culture now. The pop culture shown in the Bowie exhibition is before the arrival of the Internet. One idea was that it we would project images coming off the internet in real time, mostly fashion but that approach becomes chaotic and doesn’t look that good. Try it yourself and see what comes up. I usually check online results for Bowie everyday. JW: The selected objects came from the Bowie archive with full access and freedom given to choose which original material to work with. What new objects did you commission for the exhibition? GM: We commissioned two works of art for the exhibition. ‘Stan’s Café’ have made a rice sculpture called ‘A Million Grains of Rice’ for the entrance. In the last room we show Paul Robertson’s work ‘The Periodic Table of David Bowie’. Paul is an artist and manages Summerhall, an artist’s space in Edinburgh. The different categories are sort of lifted from lyrics. He made a similar piece about 20thcentury art and I thought I’d copy that, but I met him and he said, ‘don’t do that I’m a big Bowie fan and I’ll make you one for the exhibition’. The concept of these commissions is that at the beginning Bowie is nothing, just one in a million and at the end Bowie has become hyper-specific. Whether anyone notices that I’m not sure, but because we’re a creative museum, we like including commissioned pieces in exhibitions. JW: I noticed there’s also a handkerchief on display with his lipstick on it as if scooped up by a fan as a souvenir. GM: The only big discussion we had with his archive in New York was about the underlying concept and we chose a thematic approach. There are an enormous number of books about Bowie written by Rock journalists but we didn’t want to take a similar biographical approach. You would have ended up with a long, thin exhibition. He’s been working for 50 years since the age of 16. The V and A is really a museum of process rather than design so what we wanted to do was deconstruct Bowie. I exaggerate slightly, but what you learn looking at an artist like Picasso is that artists don’t actually change that much. Bowie is obsessed by mutation. If there’s a weakness in the exhibition, it’s that I don’t think we really explain what happened to him between the ages of 12 and 15 when he started to become a star. Perhaps it’s impossible. If you look at the photos of him at 16 he’s already a star. In a Justin Bieber world that’s not odd, but it was in the almost pre-television age of the early 1960s. It’s a funny thing that no one has asked Bowie that question. Once he’d done that, the song writing and touring all fell into place. Common patterns emerge. Bowie had it all worked out and still knows exactly what he wants to do. He only works with people who do want he wants. It would be impossible for him to work with some fashion designers, for example. And he has a sponge like mind. People say that he reads a book a day and you can imagine it. This question of how did he mutate and become so successful implies that if he can do it anyone can do it, like setting your mind on becoming the editor of a newspaper. JW: What’s moving about the exhibition and so inspirational is Bowie’s attachment to self-invention and possibility. GM: It’s sounds corny, but this afternoon I saw a schoolteacher tell his pupils ‘to go and draw what you want’ and almost had me in tears. That’s why Bowie is significant. It’s not the music or that he wears funny clothes. It’s about the idea of being yourself and that’s why he’s so subversive. We have this Bowie board in our office and we ask ourselves which cities in the world today could you walk down the street as Ziggy Stardust and Aladdin Sane. Outside the east and west coasts of America and much of Europe, you get this increasing hostility to that kind of individuality. His example is more subversive than saying follow me and he hates people impersonating him. He’s saying go and find your own thing, whatever that is and be yourself whatever your gender, like the new video with Tilda Swinton. That’s why he’s significant for the V & A and why the exhibition is so successful because it’s pointing to that idea. The reverse of this is visible in the exhibition comments book. People say things like ‘ I’m 55 and fat. My life didn’t turn out as I expected. All I have are two divorces and mortgages. That’s all I’ve achieved and Bowie has done all this stuff.’ It’s actually quite moving. He’s an actor who spent 60s trying to be a musician learning under Lindsay Kemp. Bowie is probably the only popular entertainer who’s a properly trained actor. Every rock star wants to be in film, but it’s hard work and Bowie is very good. Like the video for ‘Boy’s Keep Swinging’ where he plays three women and it was shot in a day. Look how he caricatures three women and how he carries his body. When he launched the recent record and video at age of 66 one newspaper asked is this the start of old age pensioner chic? To me that’s it. What are all these people here in this café going to do with their time in retirement when they own their own houses and want to live to 90? I don’t think at 23 he was particularly interested in young people per so now he’s 66 it’s a mutation. JW: He ageless and doesn’t respect conventional cultural boundaries. And he’s constantly changing. So who is David Bowie really? GM: That’s an interesting question. Over the past few weeks I’ve met some hard-core fans and they all go on that they saw him at various concerts and I say to them you do realise that David Bowie is a construction because they are quite happy to accept Aladdin Sane is fictional. Bowie’s legal name is David Jones and he’s married to another construction Iman, who’s Mrs Jones. That’s the weird post-postmodern thing about it. They are two sides of one coin. That is the nature of our modern culture. However across the world there are huge numbers of people who can’t live that life. The Western educated, democratic bubble allows individualization. When Bowie started it didn’t exist. The very idea you could jump class was unknown. If you don’t have any money and are living in Egypt amongst 70 million people, what Bowie offers is out of your grasp and that’s why the great fracture in the world is between individualism and mass dogma of one form or another. Bowie is not popular in middle America for the same reason. It’s Bruce Springsteen or nothing. I do think Bowie is a product of his age. When Bowie lived in Berlin in the late 70s was impossible to reach him. Bowie had confidence to disappear for 10 years. JW: Confidence seems to mark his whole career. You come out of that exhibition admiring his focus, energy and direction. GM: Between 1972 and 2004 on average he performed a concert every 11 days, which is mind-boggling and smoked 60 a day. He had an iron will. JW: What have you learnt since the show has opened? There’s this assumption that a curator’s job is finished once the show is installed and opens the door. Does the material continue to offer ideas and insights to you? GM: I never trust anything written in a book as there’s so much inaccuracy. ‘Space Oddity is a good example as it is assumed to have been written for the BBC’s moon landing coverage in July 1969 but the song was actually written earlier in January. The song is not about the moon because he’s in his tin can. I’m pretty sure Bowie found inspiration for the song in a photo of the Earth published in early 1969. One of problems dealing with popular culture is that there’s a huge area of knowledge still to be uncovered. The Beatles haven’t really been considered in terms of their impact on post-war society in general. I have been genuinely surprised by the degree of ownership shown by visitors to the exhibition. In a Damien Hirst exhibition, you don’t find many people saying ‘he’s the story of my life’. One woman brought her teenage daughter down to London to see the Bowie exhibition after her divorce in order to say there is still a future for us. I’ll get into trouble for saying this, but many curators seem scared of an exhibition that prompts an emotional reaction from their audiences but it’s considered acceptable to go into rhapsodies about Michelangelo. JW: Why did you include the lipstick-stained paper tissue in the exhibition? GM: I had a big disagreement with my co-curator about displaying it. A professor of Byzantine history at Oxford said he would send his students down to see the tissue because it is one of the best things he’d seen to explain how in the middle ages human beings became saints and how objects associated with them changed into holy relics. Medieval shrines worked that way. Bowie has a similar status for many people. The tissue was found in the same pocket of a suit on display with a tiny cocaine spoon and that’s why the tissue survived, as if you went through Mrs Thatcher’s handbag. And that’s just how you treat saints. JW: So there’s a cultural value to mundane objects invested with that kind of power? GM: When you listen to the audience, an astonishing number of people are living ordinary lives and Bowie represents a means to connect to a world described in glamour magazines like buying an expensive pair of shoes. I’m modestly paid in the public sector so when you see how Gucci the sponsor operates as a machine it’s fascinating. In London we are living in a city awash with money. JW I noticed a corporate looking guy in a suit who brought his young son and thought that Bowie’s power extends to everyone regardless of income. GM: Gucci’s head of corporate design is obsessed with Bowie and you realise that a company like Gucci will get run over unless they place creativity at the centre of what they do. It’s a strange world. If I’m honest, the exhibition is visually better than anticipated. The designers did a fantastic job. I went to Vienna recently to the newly opened Kunstkammer and every object is amazing to look that. Bowie’s objects operate like the Kunstkammer of our age and in some quarters that might be regarded as depressing! The other interesting question is why doesn’t Bowie live in London and I think it says something about Britain. Despite what he has achieved, society here still places people in boxes. Perhaps superficially, the US doesn’t appear to do the same thing. 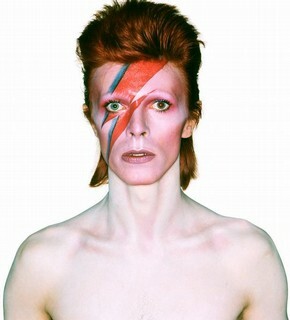 Great artists like Bowie can’t stop and get more frantic because they are getting older. It was a very odd experience curating this show. There were problems about finding the right tone and a different challenge from curating Picasso or Manet because millions of people are very passionate about Bowie. Fortunately, most fans love the show. But there’s a general audience at the museum to consider too. People in their 80s don’t know who David Bowie is. For some people aged over 70 this is not a good story but one about decline. JW: You mean the war generation? GM: Bowie says that I couldn’t be like my father and take orders. JW: What do you think Bowie’s lasting impact on popular culture will be? GM: This is going sound pretentious. In the long run, where will we be at end of the 21st century? Either Western democratic values will have won or they won’t. History is written by the victors. It seems to me the world is presently divided. I’ve been working in northern Iraq in remote villages, which are almost biblical with thousands of goats. Many inhabitants have worked in Britain’s health service and ask about the last episode of Mad Men. It seems in Kurdistan despite it’s growing oil wealth, they all want to leave and live in America. If they can’t, the flip side is that they hate it. JW: It’s both desire and repulsion. GM: The world is moving towards these polarities. Certainties of dogma give are the only things that give some lives meaning. Art is one of those two sides. In fact it’s the peak of one pole. JW: Have you made any fundamental conclusions about what Bowie has achieved in his career? JW: That explains the title of the exhibition ‘David Bowie Is’ and his restlessness. GM: We wanted to remove chronology completely and that’s why the captions are written in the present tense. We also didn’t want our catalogue essays to be authoritative. Bowie could have said it was a load of rubbish. One of the weird things about the exhibition is hearing people shouting unexpectedly because have they headphones on. I wanted visitors to be part of the interpretation. You get this when people pick up the album covers. JW: Perhaps it returns them to the record shops of youth and their own record collections? GM: A lot of people say they want to dance in the exhibition but they don’t dance, which is a real pity. Visitors even write and say they want to live here!